SnapCacklePop: MKTO prepare for their first Australian tour..! MKTO prepare for their first Australian tour..! Dynamic duo MKTO will be returning to our shores this April for their first ever national tour of Australia. 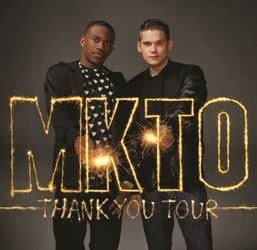 MKTO most recently enjoyed success with their self titled debut album, which shot to the #1 spot on iTunes hours after release and went on to debut at #1 on the ARIA charts. Since hitting the charts in late 2012, MKTO have been riding a wave of success. Their debut single Thank You peaked at #2 in the Australian ARIA Charts, achieving 4 x Platinum sales, and a top 5 radio hit. Following in its footsteps, Classic was another pop hit that peaked at #3 on iTunes, top10 airplay and achieved triple Platinum sales. The duo’s current single, God Only Knows is another infectious pop hit, already achieving Platinum sales and is currently making its way up the airplay chart. Joining MKTO on the Thank You Tour will be Taylor Henderson, who is in the midst of readying his debut studio-album due for release later this year. Read more about his album in our recent interview with the cheekily charming singer. And if you love MKTO, you should check out our interview with the boys now..!